George Eugene Belknap, Naval Officer, born in Newport, New Hampshire, 22 January 1832. He was appointed Midshipman from New Hampshire, 7 October 1847; became passed Midshipman, 10 June 1853, master in 1855; was commissioned Lieutenant, 16 September 1855 ; Lieutenant Commander, 15 July 1862; and Commander, 25 July 1866. As a Lieutenant he commanded a launch at the capture of the Barrier forts at the mouth of the Canton river, China, in November 1856, and assisted in undermining and blowing up the four forts. He commanded the boats of the "St. Louis" at the reinforcement of Fort Piekens in April 1861, and was commanding officer of the iron-clad "New Ironsides" in her various engagements with the fortifications in Charleston harbor from 1862 till 1864. He was highly praised by Admirals Dupont and Dahlgren for ability in making the attacks and managing his vessel under fire. In 1864 he commanded the gun-boat "Seneca" of the North Atlantic blockading squadron, and afterward the iron-clad "Canonicus " in the two actions with Howlett House battery in December 1864, and in the attacks on Fort Fisher in that and the following month. After the capture of the fort he went to Charleston, and was present at the evacuation. He commanded the same vessel in Admiral Godon's expedition to Havana in search of the confederate ironclad " Stonewall." His name was associated with those of Commanders Parrott and Calhoun and Lieutenant Weaver in a commendatory letter of Admiral Porter declaring that these officers had given a world-wide reputation to the monitors by their efficient handling of the new type of vessel. 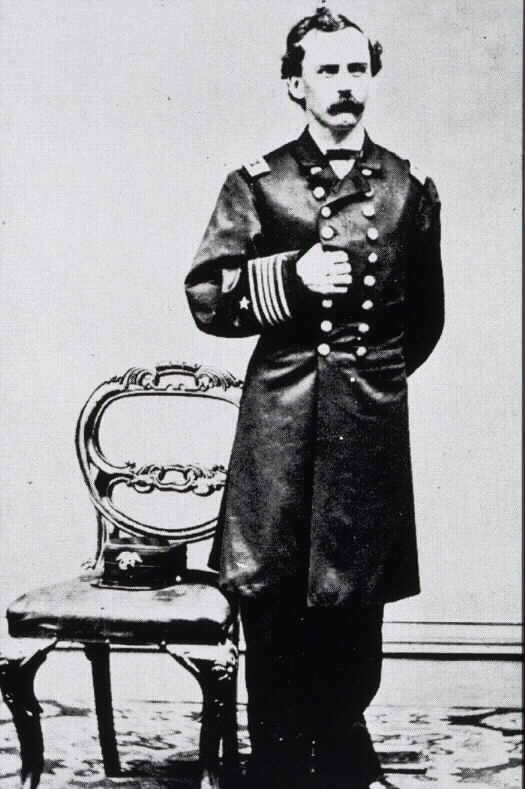 In 1867-'8 Commander Belknap commanded the flag-ship "Hartford " of the Asiatic squadron; in 1869 he was on navigation duty at the Boston navy yard; in 1874 he was engaged in command of the steamer "Tuscarora" in taking deep-sea soundings in the North Pacific ocean, with the bject of finding a route for a submarine cable between the United States and Japan. 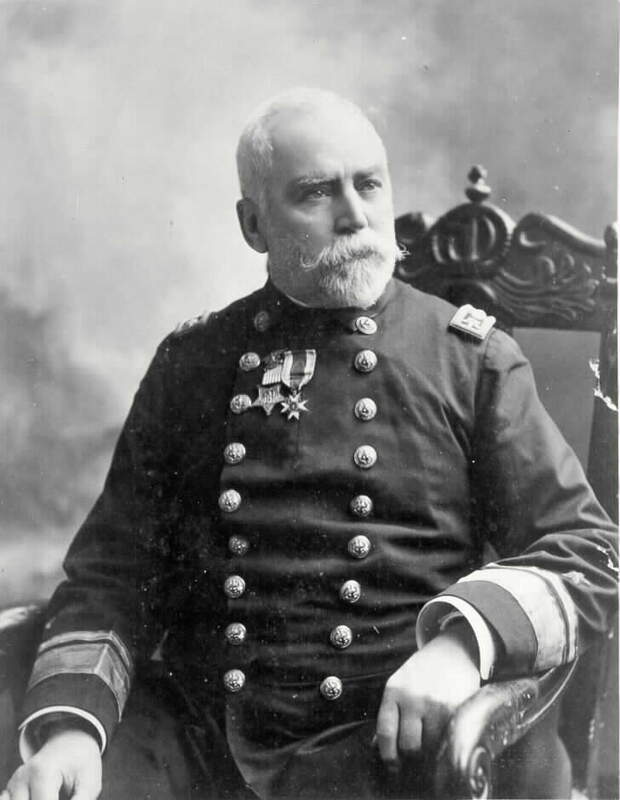 He was made a Commodore, 2 March 1885, and appointed superintendent of the naval observatory. Born at Newport, New Hampshire, January 22, 1832, he was appointed a Midshipman, 1852, and subsequently promoted through the grades to Rear Admiral, 1889. He married Ellen D. Reed, December 8, 1861; and married a second time to Frances G. Prescott, of Calcutta, India, December 23, 1866. Was in fighting service in China, and the capture of the Barrier Forts, 1856, and throughout the Civil War, participating in the bombardments of forts and batteries in Charleston Harbor. In both fights at Fort Fisher. In 1873, he was ordered to the steamer USS Tuscarora to make deep-water soundings in the North Pacific with a view to submarine cable. His discoveries concerning topography of the ocean bed were recognized by scientists of the world. He was senior officer at Honolulu at the time of disturbances at the election of King Kalukaua. At various times was in command of US Navy Yards at Norfolk, Pensacola, Mare Island and was the Superindentent of the Naval Observatory at Washington, D.C. He was President of the Navy Torpedo Board and President of the Navy Board of Inspection and Survey. "Died on duty, Key West, 1903"
Also buried in Section 3 of Arlington National Cemetery is his son, Reginald Rowan Belknap, Rear Admiral, United States Navy.